The UN has made public new allegations of sexual exploitation and abuse by its personnel in the UN Mission in the Democratic Republic of the Congo (MONUSCO). By law, the alleged perpetrator should be referred immediately to the police in the Democratic Republic of the Congo, where the accused is posted. Time is crucial in sexual assault cases. The UN Office of Legal Affairs insists that UN practice is to refer reports it receives against its non-military staff to the appropriate authorities. In fact, it rarely turns its personnel over for criminal investigation and prosecution; accused rapists are dealt with internally, where they face little more than administrative review by the UN bureaucracy. Why is the UN not referring the case immediately to the “host state” — the DRC? Has the government of the DRC been informed? 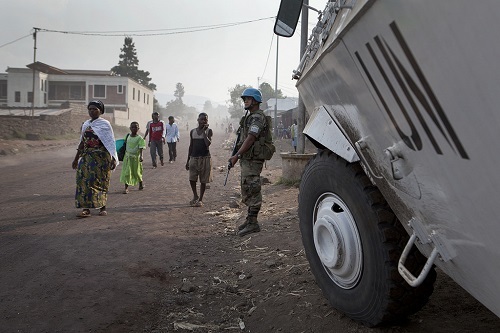 Has the UN asked the DRC authorities to conduct a police investigation? What is the home state/nationality of the alleged civilian perpetrator? If the case isn’t being investigated and prosecuted by DRC authorities, to which state’s authorities WILL the case be referred for criminal accountability? AIDS-Free World is an international advocacy organization devoted to exposing and addressing injustice, abuse, and inequality. Its Code Blue Campaign aims to end impunity for sexual exploitation and abuse by UN peacekeeping personnel.